WASHINGTON D.C., 06 October 2016 – On the day after the Paris Agreement on climate change became law, finance ministers representing more than 40 emerging economies that form the Vulnerable Twenty (V20) Group met in Washington, DC to discuss how finance is key to driving the urgent action required at home. 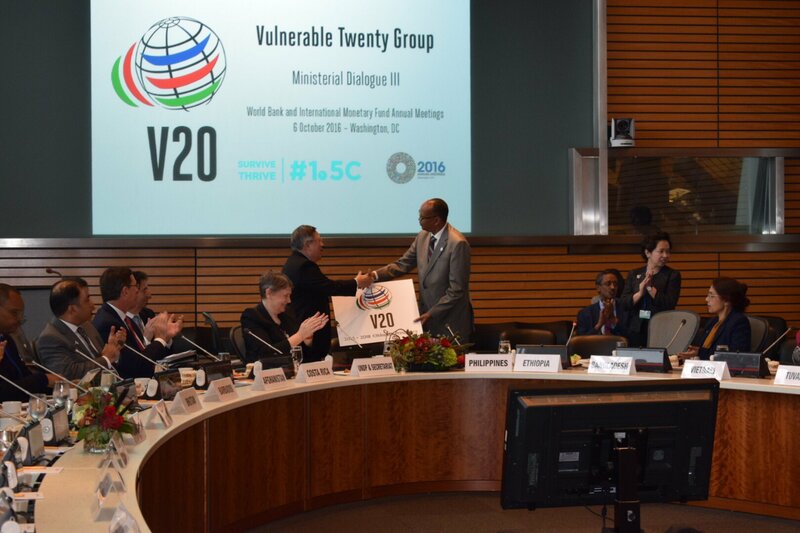 At the event, on the sideline of the Annual Meetings of the International Monetary Fund and World Bank Group, Ethiopia assumed the Chair of the V20 Group which was founded in 2015. Carlos Dominguez, the Secretary of Finance of the Philippines called for a clear roadmap towards the mobilization of $100 billion in additional financing flows to help the most vulnerable countries deal protect themselves. He said V20 international cooperation would “provide our domestic economies with vital support and confidence we need to excel in fighting climate change”. Abdulaziz Mohammed, the Minsiter of Finance and Economic Cooperation of Ethiopia, highlighted devastating effects and “lethal excesses caused by the world’s most gigantic externality”, adding that “we would like to express Ethiopia’s commitment for its candid leadership for the achievement of the V20 vision, and to work towards the fulfilment of the Paris climate agreement at large”. A V20 & Climate Vulnerable Forum Site © 2015-2018.